Ta dah! Tis done! 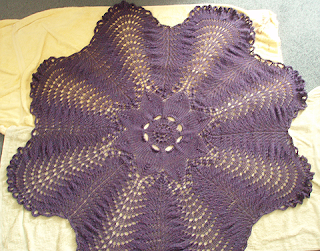 This took just over a month to knit. 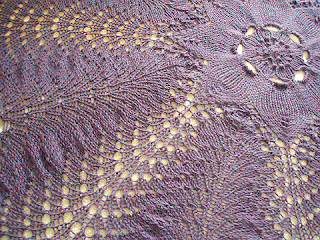 It's Jared Flood's pattern, the Hemlock Ring Blanket, which is basically an old-fashioned doily pattern, with a Feather and Fan edge, knit in thick wool, instead of with fine laceweight yarn. Blocking. I wimped out, and didn't pin it. Not enough pins, knees, or time. I went with the original knitted edging. It took 3 nights to complete, but I really like it. Rustic Damson 12 ply, just under 3 balls. Gorgeous. I love this pattern so much I even want to knit it again - which is a rare thing! Will send this down to Tassie in the next week or so – will be hard to let it go, but I know it's going to a good home. Work on The Book continues apace, I've written nearly 5 of the 6 text chapters (~15,000 words all up). Need to work on weekends - not all day, but for at least half of them. It's basically going very well, but I am pretty weary. And last but not least, in 2 sleeps Dotter gets her insulin pump! This will entail nearly 3 days at hospital (as an outpatient), and quite a few broken nights, as her blood sugar has to be tested through the night for the first little while, as we (ie me, Dotter, the diabetes educators and nurses, and her endocrinologist) figure out the right levels of insulin for her. Bit nervous about the whole thing, it's a quite different ball game from using insulin pens. Much bigger risk of hyperglycaemia and DKA (diabetic ketoacidosis). oh lovely. Gorgeous colour. It seems to have blocked really well without aggressive pinning. I did that to get the maximum size I could, but can see it works just as well without it! OK, that's officially gorgeous!! It looks wonderful and the colour is perfect(even though it's not green!!) The edging was totally worth the effort. Good luck with the insulin pump Dotter. Hope all goes well. Glad to hear the book is progressing well too. Oh it's wonderful - great job and simply LOVE the colour! Good luck to Dotter with the pump - hope it works out well. Wishing Dotter all the best as she has the procedure done to receive her new insulin pump. May it go smoothly and improve her quality of life. 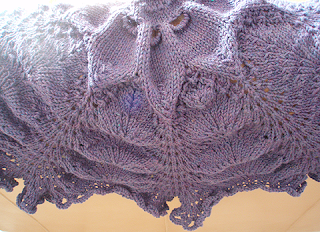 What a lovely piece of knit work you're showcasing here on your blog! It is DIVINE. Oooh, aaaaah! It's beautiful. So impressed you got away with not doing the pinning too. It makes sense for a gift, as you won't be there to block it obsessively the next time it is washed will you? Hope the insulin pump process goes well, I'm sure it will all be worth it. the hemlock ring is fabulous and I'll tell you, the insulin pump is such a good thing. You'll be very pleased and it's used so frequently here, she'll have a whole new life! All best wishes to the darling Dotter for quick and easy implant and adjustments. Hooray for her! The hemlock ring is exquisite! perfect color, beautiful work. Bravo!! Just a month to knit. You continue to amaze me. It is beyond beautiful. Love the pattern and the color. Absolutely beautiful. 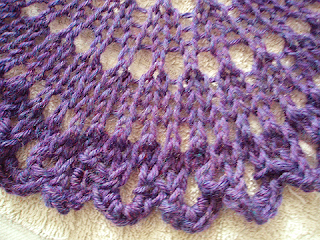 The yarn seems to have a lovely sheen to it as well. Does it have any silk to it or is it just glare off my screen? Well for all of you that love the rug, its here in tassie and its even more beautiful than the pictures! The 3 felines have their beady green eyes on it but I am afraid its only for the human lap and felines will have to admire from afar :-) You are a genius! !